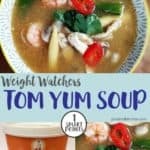 This tom yum soup is just 1 SmartPoint per portion on the Weight Watchers Flex / Freestyle program. This hot and sour Thai soup makes a delicious low point lunch or snack. 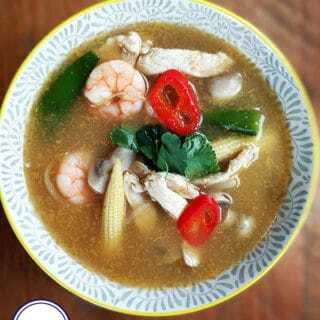 I love Tom Yum Soup! So I was so excited to find, when Chicken and Prawns became ‘zero heroes’, I was able to make this soup for just 1 Smart Point per portion. In fact, I was so excited that I had it for my lunch every day for a week. However, variety probably is the spice of life and on Weight Watchers we are always being told to eat a variety of different food! 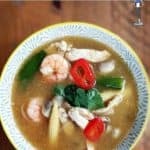 This recipe is an adaptation of a Tom Kerridge, Tom Yum recipe. I have adapted it a little bit, firstly to save time and secondly to fit with ingredients that I have more readily available. If you would like the Tom Kerridge recipe, then you can find it in his book ‘Lose weight for good’. A couple of notes about this recipe – if you can’t find galangal root then you can use chopped ginger (just use a little bit more). Galangal root will give your Tom Yum soup a more authentic taste , but ginger does work well. 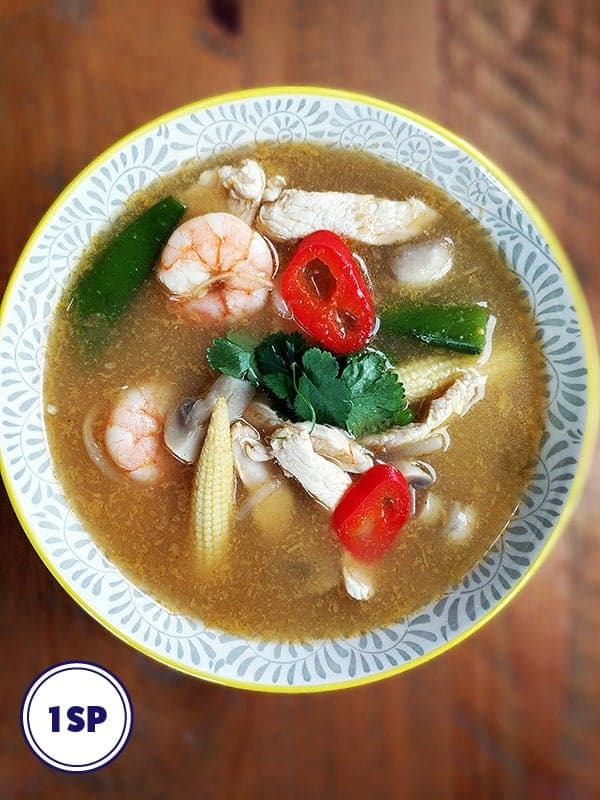 I now keep a lump of galangal root in my freezer for times that I crave tom yum soup! I made chicken stock using a stock pot but I have also made this soup with ready made stock from Waitrose. If you do use ready made stock, then just check the Smart Point value first as this can put the points up by a couple of points per recipe. My last suggestion about this recipe is to use a good quality Tom Yum Paste. There are many different brands available, some of which are much nicer than others. I used this one. Remove the outer layers of the lemongrass and discard before slicing thinly. Thinly slice the galangal root. Place the galangal root in a saucepan along with the sliced lemongrass, kaffir lime leaves, shrimp paste, chicken stock and water. Simmer for 10 minutes. Remove the stock from the heat and sieve into a new saucepan. Stir in the tom yum paste until it disperses and then add the sliced chilli and bring it back to a simmer. Add the mushrooms and babycorn and cook for 5 minutes. Add the thinly sliced chicken and king prawns and cook for a further 4 minutes. Add the mangetout and the bean sprouts and cook for 1 - 2 minutes. Check that the chicken is cooked before taking off the heat. Add the lime juice before ladling the soup into bowls. Garnish with torn coriander leaves.